Social Justice Warriors is a satirical role-playing game that transforms the standard medieval fantasy heroes of RPGs into social media crusaders facing an endless horde of ignorant internet trolls. Inspired by a list of “social justice warrior” videogame journalists to avoid, Social Justice Warriors expresses frustration with how people use divisive labels – like “SJW” and “troll” – to discredit and silence each other. No matter what social values you have, attacking and ridiculing other people not only fails to achieve progress but has an additional effect of escalating the conflict while exhausting your patience and eroding your reputation. For the month of December 2014, all proceeds Nonadecimal Creative received from Social Justice Warriors sales were donated to the American Foundation for Suicide Prevention, raising $200. Read more here. For a more thorough explanation of why this game exists, read Releasing a Social Justice Warriors Game or Making a Social Justice Warrior Game. Social Justice Paladins duel foes with 140 characters or less while shrugging off attacks with a press of the Block button, at least until their foes create new accounts. Social Justice Clerics serve in the name of their patron sub deity, taking solace in its comforting presence to heal and summoning its divine power to smite their enemies. Social Justice Mages conjure powerful constructs of fact and opinion to alter minds and reality while occasionally summoning an activist organization or hurling a scathing fireball of a blog post. Social Justice Rogues fight fire with fire. Throw flurries of vitriolic character attacks, confuse enemies with smokescreens of alternate accounts, then delete your accounts and withdraw into the shadows of the net. The warriors and their opponents fight and fall by the measure of their Patience and Reputation meters. Trolls confound your patience with logical fallacies and ad hominem attacks while actively working to destroy your reputation with wild accusations and photoshopped evidence of your misdeeds. How you choose to respond to these attacks is up to you. Relying solely on logical arguments to change minds doesn’t work very well online, but resorting to personal attacks and mudslinging will erode your moral high ground. With the aid of your warrior allies and a few mysterious outsiders, you have the ability to reshape the conflict. Take down a multitude of trolls to attain a new high score or make sacrifices to become a noble Social Justice Champion, who takes no joy in tearing down other human beings. The Champion relies on mediation and reconciliation, listening to their concerns and proposing mutually beneficial compromise. The utility of compromise is just as uncertain as destroying opponents, but a Champion values its beliefs more than temporary gratification. Email the developer, 10011, for a download key or interview. You can find more information and screenshots from the game on the Social Justice Warriors press page. As a developer, there’s nothing more exciting than watching someone play your game. Make videos of my game. Make money on those videos. Become rich and powerful. Buy a yacht. Send me your video link so I can show everyone I know. Then they’ll buy my games so I can buy a yacht too and we can race them. 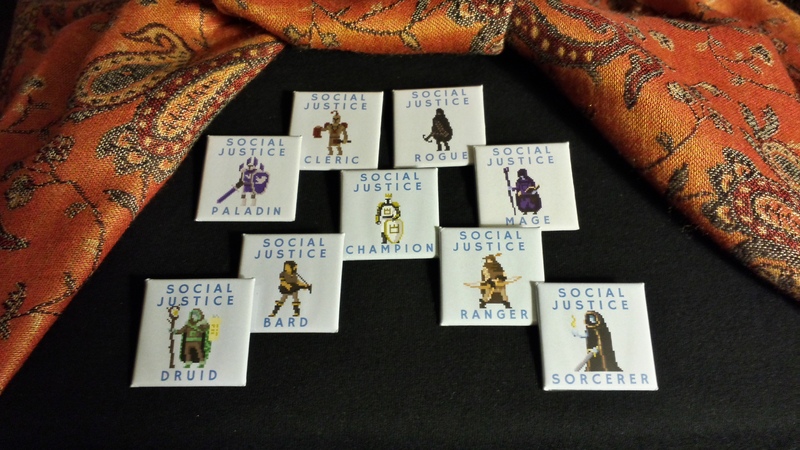 Nonadecimal gave away 1700 of these limited edition Social Justice Warrior pins at Indiecade, PAX South, GDC, and PAX East. Hope you enjoyed them!